We think we have found the dreamiest DIY party favor tutorial ever! This one is from eat drink chic, which we love to visit whenever we could squeeze the time..
Fairy floss is an all time carnival/party snack and I just love to watch how it's made.. Packaged in a translucent envelope, it's just too hard to resist! Transluscent Paper with white polka dots for the envelopes. 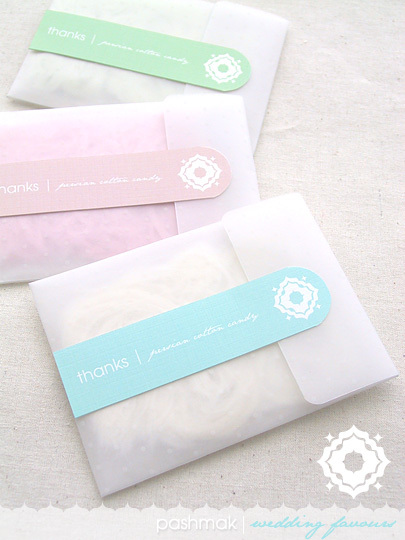 White printable sticker paper or white card for labels- I've used a textured white card. Double sided tape or glue. Small clear plastic sealable bags- these will need to fit inside the transluscent bag. (If they are too long they can always be folded back slightly). Label design in assorted colours- download below. Print out your envelope design onto transluscent, white polka dot paper and using the scalpel, cut out, score along fold lines (indicated by dotted lines) and construct your envelope. I've used double sided tape on the side tabs to stick the envelope together. Use the rounded corner punch on the corners of the lid. Put your Pashmak into a sealable bag and make sure it is sealed thoroughly. Slip this bag into your transluscent envelope. Print our your labels and cut out with scalpel. For the rounded semi-circle edge, I found that cutting carefully and slowly with a scissors produced quite an accurate cut and I didn't need anything more sophisticated than that. If you are using white card, put a strip of double sided tape along the length of the back of your label and stick onto the front of the bag. (View photos for positioning). Because of the nature of Fairy Floss, it should be stored in a dark, cool place in an airtight container. Because of this it is probably best to package your favours at the very last possible moment before your wedding or party, (perhaps the day before) and it is crucial that you store it inside a sealable bag first before you put it into your transluscent envelope. In fact, to be on the safe side I would actually experiment before the event and test to see whether leaving the Pashmak in your sealable bag will preserve it adequately overnight.